The technique has been variously known as "electrography", "electrophotography", "corona discharge photography" (CDP), "bioelectrography", "gas discharge visualization (GDV)", "electrophotonic imaging (EPI)", and, in Russian literature, "Kirlianography". It was found, that objects which are not alive, do not change parameters of their "aura" more than 2%. 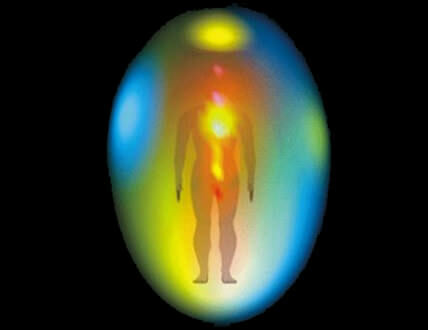 LIVING objects however can change their aura field dramatically and quickly. This provides scientists with unique tools to study physics of LIFE and consciousness using bio-electrography. For example, Prof Bunzen in Russia found that the response in Kirlian Aura seems to precede (appear as soon or earlier than) electric processes in the brain during a decision making process. From his research, presented in 2001 at the International Congress "Science Information, Spirit" in St Petersburg, it seems that a thought "appears" in the aura before any electrical activity can be detected in the brain. Is our consciousness electro-photonic to begin with? Each body area has a language as to what the organs do, the muscles, the nerves, etc. When a condition occurs in the body in a localized area, it's to help us discover what we might need to change in order to keep "homeostasis" in our emotions, mental reasoning, and spiritual living. 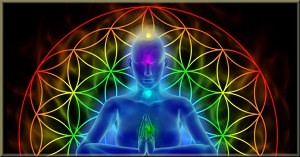 Scientists such as Beverly Rubik have explored the idea of a human biofield using Kirlian photography research, attempting to explain the Chinese discipline of Qigong. Qigong teaches that there is a vitalistic energy called qi (or chi) that permeates all living things. Rubik's experiments relied on Konstantin Korotkov's GDV device to produce images which were thought to visualize these qi biofields in chronically ill patients. Vitalistic energies, such as qi and prana, exist beyond the natural world.